Background: Inflammation is a biological rejoinder of vascular tissues against destructive agents e.g. irritants, damaged cell or pathogens. During inflammation, respiratory burst occurs by activated phagocytes which help to destroy invading pathogens. Phagocytic cells such as neutrophils and macrophages are one of the major sources of reactive oxygen species (ROS) and nitric oxide (NO). Normally, the redox environment is maintained by various antioxidant defense systems, however, these reactive oxygen species may be destructive and can lead to various pathological conditions. 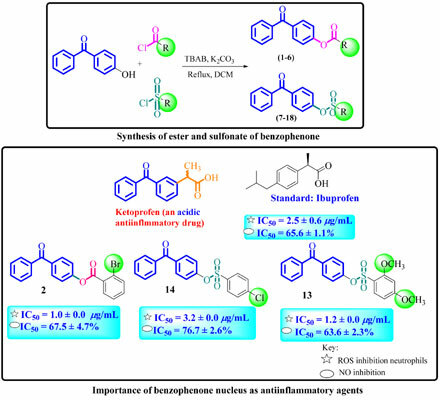 Methods: Benzophenone esters and sulfonates (1-18) were synthesized through one pot synthesis by reacting 4-hydroxy benzophenone either different benzoyl chloride or sulfonyl chloride. These synthetic compounds were evaluated for their in vitro immunosuppressive potential on two parameters of innate immune response including inhibition of intracellular reactive oxygen species (ROS) and nitric oxide (NO). ROS were induced in polymorphonuclear leukocytes (PMNs) isolated from human whole blood by serum opsonized zymosan stimulation, whereas NO were produced in J774.2 cells by lipopolysachharides (LPS) stimulation. Moreover, cytotoxicity of compounds was also determined using NIH-3T3 fibroblast cells (ATCC, Manassas, USA) was evaluated by using the standard MTT colorimetric assay. Results: All compounds inhibited the production of ROS at various extent among which compounds 2, 5, 6, 8, 10, 13 and 16 were found to be the potent inhibitors of ROS with IC50 values ranging between (1.0 - 2.2 µg/mL) as compared to ibuprofen (IC50 = 2.5 ± 0.6 µg/mL) as the standard drug. Compounds 2, 7, 11, 13, 14 and 18 showed good inhibition of NO production with % inhibition values ranging between (63.6% - 76.7%) at concentration of 25 µg/mL as compared to NG-monomethyl-Larginine (L-NMMA 65.6 ± 1.1 µg/mL) as the standard. All other derivatives showed moderate to low level of inhibition on both tested parameters. Cytotoxicity activity also showed nontoxicity of synthetic compounds. Structures of all the synthetic compounds were confirmed through 1H-NMR, 13C-NMR, EI-MS and HREI-MS spectroscopic techniques. Conclusion: Compounds 2 and 13 were found to be good dual antiinflammatory (ROS and NO) agent. However, compounds 5, 6, 8, 10 and 16 were found to be selectively active for ROS inhibitory studies. Compounds 7, 11, 14 and 18 were discriminatory active at NO inhibition assay. These initial findings of antiinflammatory activity concluded that these compounds might have the potential to develop a novel non-steroidal antiinflammatory drugs (NSAIDs), non-acidic antiinflammatory agent. Most active compounds 2, 5-8, 10, 13, 14 and 16 showed nontoxicity of synthetic compounds. Keywords: Benzophenone, ester, sulfonates, immunosuppressive, Reactive Oxygen Species (ROS), Nitric Oxide (NO). Keywords:Benzophenone, ester, sulfonates, immunosuppressive, Reactive Oxygen Species (ROS), Nitric Oxide (NO). Abstract:Background: Inflammation is a biological rejoinder of vascular tissues against destructive agents e.g. irritants, damaged cell or pathogens. During inflammation, respiratory burst occurs by activated phagocytes which help to destroy invading pathogens. Phagocytic cells such as neutrophils and macrophages are one of the major sources of reactive oxygen species (ROS) and nitric oxide (NO). Normally, the redox environment is maintained by various antioxidant defense systems, however, these reactive oxygen species may be destructive and can lead to various pathological conditions.